Nut Lovers will love you for sending this premium assortment of small batch caramels and nuts smothered in milk and dark specialty chocolate. This enticing box from famed Ethel M features almonds, pecans and toffee crisp, as well as chewy and creamy caramel and decadent chocolate. 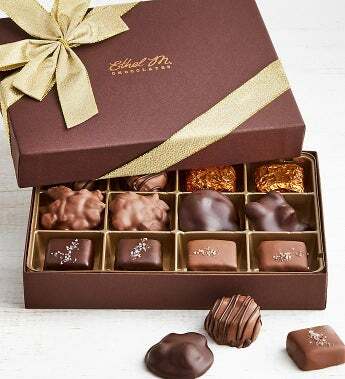 The perfect blend of crunch and caramel, this collection brings together unique flavors created by the Ethel M Chocolatiers and pairs them all with gourmet premium chocolate. This is a gift that will be remembered!